Brand new complete Frame Mount Pedal Assembly Kit. This kit is designed 1928 to 1931 Ford Model A (car and truck). Though it will work on other street rod applications. This kit is complete and includes. Complete Under Floor Pedal/Bracket Assembly. Manual Master Cylinder (will work with disc and drum applications). This is a complete kit for mounting the power booster to the frame with the pedal coming up through the floor. 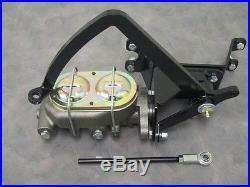 This kit is ideal for light weight Model A that does not need a power brake booster. This is the perfect kit for manual disc and drum brakes. When mounting your master cylinder under the floor, residual pressure valves are required to prevent fluid from bleeding back to your master cylinder (causes loss of brake pressure). New parts are being added daily! Whether you're a novice rodder or an experienced builder, there is something here for you! PB-AUM Pedal + Manual Master Cylinder. Please wait for us to send you a combined invoice before paying. We have discount prices on thousands of parts for your Street Rod, Hot Rod, and Custom Car or Truck. Parts are added to our store daily, so check back often for the latest deals! Plus, we have access to thousands of parts that are not listed. We do get hundreds of emails daily, so at times it may take us up to 72 hours to respond to your emails. The item "1928 to 1931 Model A Ford Frame Mount Pedal Assembly w Manual Master Cylinder" is in sale since Monday, December 12, 2011.